A couple of months ago, Google introduced Android 7.0 Nougat and began the deployment of updates on the company's Nexus smartphones, leaving manufacturers beyond Mountain View with the possibility to carry out the update later, as a privilege of users who own a cell phones of the American brand. Over time, several companies have begun to conduct official testing for their high-end models, and now an OEM has decided to join them: HTC. 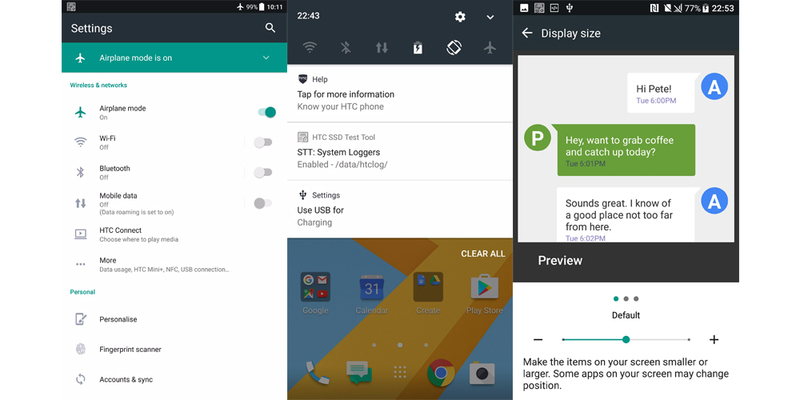 According to some screenshots published by a famous leaker known on the Internet as LlabTooFeR, the latest version of the operating system is about to officially reach the HTC 10. In any case, the info of this release is still a mystery, although a mystery confirmed. In the tweet that shows the leaked images, LlabTooFeR ensures that we are about to have news of Android 7.0 as part of the HTC 10. This news only applies to European Union and international variants of the device unlocked. At the moment, it is unclear how long it will take, because the update should also land on blocked cell phones or from telephone carriers. Based on some screenshots included in the tweet, it seems that HTC has not made any major changes to the interface (it could be a Nexus at first glance), but it draws attention to a new design at the top, a new drawer In the notifications box and a redesigned and more compact Settings menu. HTC has not announced official dates for the update rollout, but we are confident of the reliability of the news by LlabTooFeR, who on the other hand offers an interval of time that could be between the end of November and the beginning of December. Owners of an HTC 10 will have to wait a few days to check if this is true. In any case, we remember again that the image shows the firmware of the European version of the HTC 10, and there is doubt about the launch for the rest of variants.